Due to its high toughness, brown fused aluminum oxides are recommended for use in bonded abrasives such as grinding wheels and cutoff wheels, coated abrasives (paper & cloth), sandblasting abrasives, as well as refractory applications. 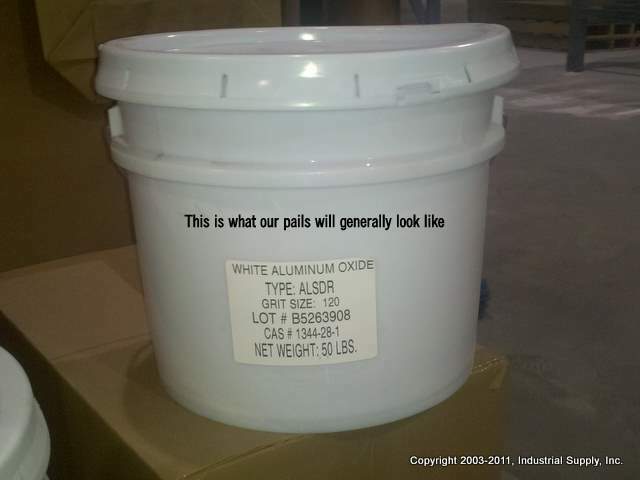 Aluminum oxides are fast and effective for removing rust, mil scale, paint, carbon deposits. 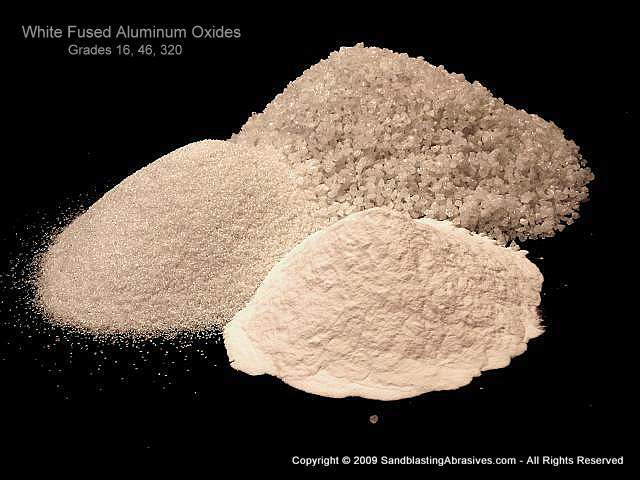 Aluminum oxide media will remove deposits from your substrate at twice the speed as sand, without all the health risks. Aluminum Oxide media is great for antiski, antislip flooring coatings and as an additive for epoxy floor systems. 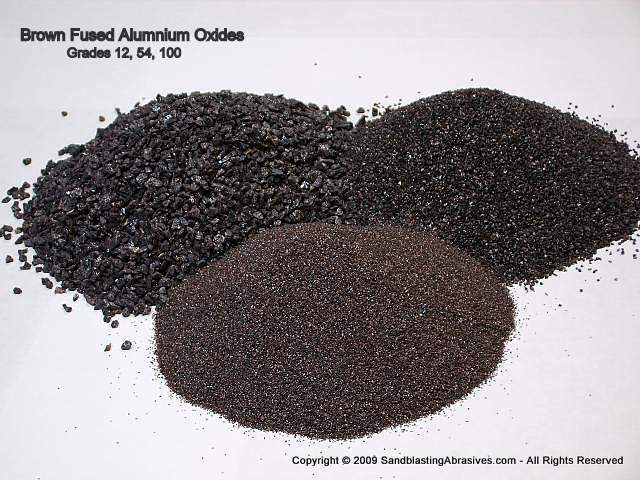 Use this page to order Coarse Grades of our Brown Fused Aluminum Oxide Abrasives. Minimum order is 50lbs. See bottom of page for Quantity Discounts. If you are looking for fine grades, please go to this page. Shipping: Small orders under 200 lbs ship via UPS Ground. See details below for larger orders. Can be recycled multiple times. Brown Fused media has a low friability, so it will NOT break down and shatter on impact easily. (NOTE: White fused AO has a high friability rating and breaks down rapidly. Sinterblast Aluminum oxide is a nice balance between the two with a medium friability, and a low price point, thus often used by powder coating companies). Alpha macro crystal from trigonal class, hexagonal system. All our blasting medias are new, not reclaimed. Sandblasting - works great on metal. Sizing - These Are Approximations Only. Approximations are based on using a pressure blaster on hot rolled steel, having tightly adhering mill scale, using a 90-100 psi. Anchor patterns will vary tremendously based on other variables such as hardness & type of steel, level of corrosion being removed, blast angle, blast distance from the steel, etc. Grit Sizes: A very simplistic, non-technical way of understanding coarse grit sizes is to use a 1" mesh square as an example. A 100 grit will have 100 tiny holes in that 1" square and thus particles are roughly 1/100th of an inch or finer. A #8 grit will have particles of 1/8th inch, and so on. The smaller the grit size number, the coarser the grain, which seems counter-intuitive until you use the 1 inch square mesh to better understand the concept. A 12 grit is very coarse compared to a 220 grit. Pallet Packaging: This media is generally sold by the net ton, or per 2,000 lbs. Packaged in 50lb bags, 40 bags per pallet. One net ton per pallet. 400lb Drum Packaging: We can package media into 400lb drums for you. 4 drums per pallet or 1,600lbs/pallet. Please request this when you ask for a quote. Yes, we can ship a single drum if that is all you need. DiscountáPricing: Please use our Quote Request form to obtain custom pricing on larger quantities, with freight. Remember to tell us your ship-to address and the total number of lbs or tons you want a bid on. Loading Dock: Generally, you need to have a commercial address with loading dock to receive orders over 200lbs. If you do not, we can ship it to a local terminal and you pick it up yourself from the terminal. We can also ship to a residential address, but this is very costly and not recommended. What Is Friablity? Short Answer: How easily/quicky a media shatters on impact and breaks down. This is different from Hardness Rating. Sandblasting medias can have the same hardness rating, but completely different Friability Ratings. Think of Friability as durability. Brown Fused Aluminum Oxides have a LOW friability, so it will break down slowly, and coarser sizes can be recycled and reclaimed. White Fused Aluminum Oxides have a HIGH friabilty, but the SAME HARDNESS rating (in general) of Brown Fused Aluminum Oxides. It will thus shatter on impact and break down quickly, without doing as much damage/impact to the substrate. Sinterblast, or Sintered Aluminum Oxide has a MEDIUM friability. Think of it as the middle ground between Brown Fused and White Fused. It can be recycled in coarse sizes, but will not have the long life of a Brown Fused AO. It is often preferred by powdercoating companies due to its lower cost. If you are just taking off mil scale prior to coating, this is a great media to try out. THIS IS WHY YOU BLAST AT A 60 PSI WITH THIS MEDIA. ANYTHING HIGHER AND YOU WILL NOT ACHIEVE GOOD RESULTS..